Concorde Hotel Kuala Lumpur has always been a favorite for mooncakes when Mid-Autumn festival is near. This year, Concorde is bringing Colours of Mid-Autumn with a contemporary take on their mooncake packaging. 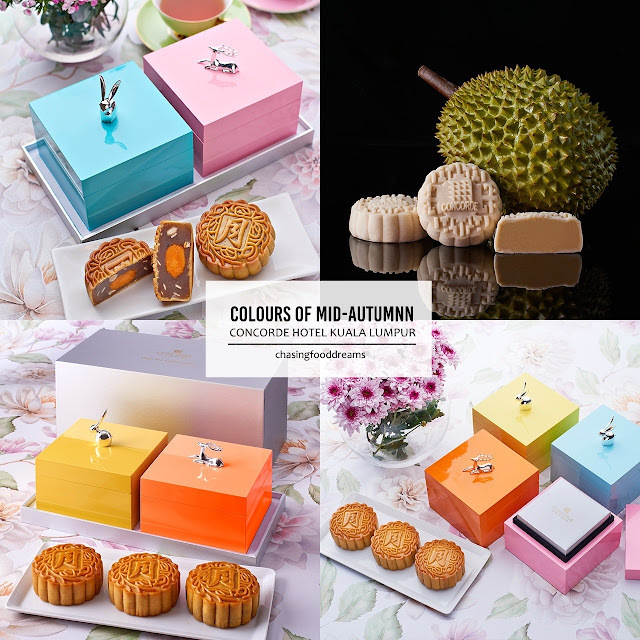 Featuring four gorgeous pastel hues lacquer giftboxes, adorned with silver rabbit and deer figurines, Colours of Mid-Autumn by Concorde is the perfect mooncake gift for family, friends and business acquittances. These wooden giftboxes are not only pretty to look at but are solid and makes great keepsake boxes. Available in four colours of pastel blue, pink, yellow and orange, Concorde mooncake giftbox set is available in 2pcs or 4 pcs set. Available from August 5 to September 24, 2018, they are available at the lobby of Concorde Hotel Kuala Lumpur as well as Mid-Valley kiosk. Concorde’s bestseller – Snowskin with Musang King Durian is back as usual. The award-winning mooncake is filled with the creamy flesh of the King of Fruits, enticing durian lovers to tuck into glorious bites of pleasure. These are available in set of 2 pcs at RM98 or 4 pcs at RM168. Other snowskin mooncakes include Snowskin with Yam & Egg Yolk, Snowskin Lotus Paste with Longan & Wolfberry and Snowskin Lotus Paste with Roselle. *Galaxy Collection is available at mooncake kiosk (hotel lobby). For ‘Colour of Mid-Autumn’ mooncake set, please visit Concorde mooncake kiosk at South Court, Ground Floor, Mid Valley Megamall. Concorde’s mooncake kiosk is located at the hotel lobby (10.30 am – 8.00 pm) and also at Mid Valley Megamall (10.00 am onwards, while stock last). For more information, call (012) 399 5007 or email your queries to fbkl@concorde.net. 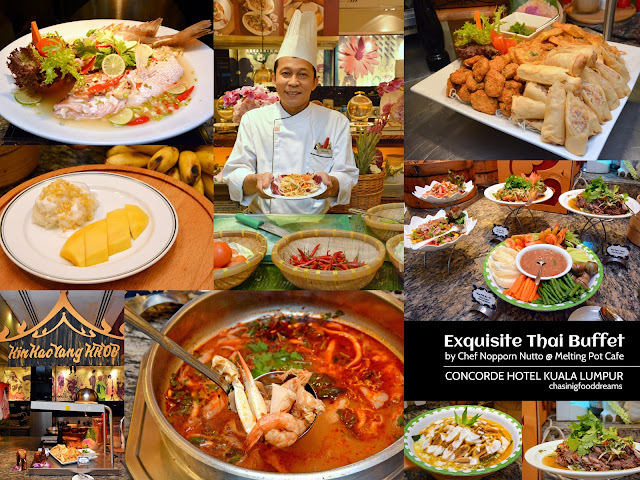 Savor a Thai-talizing buffet at Melting Pot Café for the whole month of August with new Thai Chef Nopporn Nutto at Concorde Hotel Kuala Lumpur. Chef Nutto is bringing a feast of flavours to the table with his repertoire of authentic Thai dishes. Melting Pot Café has always been a popular hotpot for a sumptuous buffet feast. Highlights of the buffet always includes a gorgeous Seafood on Ice Bar, Teppanyaki Seafood station, Noodle station, Grill station and Dessert bar among other specials of the day. And while one is savoring the spread, be serenade by Melting Pot Café’s long standing live music by Batak strollers which never fails to impress with their list of international music. Over 15 dishes from a rotational menu are available every night through the month of August from Chef Nutto. With more than 17 years of experience, Chef Nutto comes from Bangkok, the capital city of Thailand and also a famous city full of Thai flavours that combines the North and South of the country. To kick start the feast, head straight for Thai kerabu salads and appetizer bar where Chef Nutto and culinary team will whip up Thai Som Tham or Papaya Salad to your liking. Tuck into Nam Prik Ka-Pi or Thai Sambal with Vegetables, Yum Kai-Doa or Thai Egg Salad, Yum Nuea- Yarng or Thai Beef Salad and more for an explosion of unforgettable flavours. For appetizers, savor Thai Spring Rolls, bouncy Fish Cakes and Fried Bread with a side of Thai sweet chili sauce. The Seafood on Ice bar also makes a good appetizer with succulent prawns, mussels and fresh oysters, all to be savored with wedges of lemon, cocktail sauce and tobacco sauce. Hit the buffet warmers and tuck into splendor of Thai flavours of salty, sweet, spicy and sour with Thai delights of Steamed Fish with Lime & Chili, Sauteed Beef with Chili & Basil, Fish in Hot & Sour Soup, Thai Fried Rice, Stir Fry Kailan with Salted Fish and more. And no Thai meal is ever complete without the obligatory Tom Yum Seafood Soup! Besides Thai dishes, diners can also savor other cuisines as well as a live Teppanyaki station of fine seafood and meat of your choice. The Roast station offers Roasted Duck stuffed with rice and other goodies. The duck is beautifully succulent and tasty. Desserts, especially Thai favorites, are must-haves. Tuck into glorious sweet and juicy Mango & Sticky Rice topped with thick and creamy sweet and salty coconut cream with crispy mung beans or Banana with Coconut Milk as well as Thai Tab Tim Krob. There a whole lot of other desserts like cakes, kuih muih, Chocolate Fountain, Bread & Butter Pudding jellies, fresh fruits, ice cream and more to choose from. Melting Pot Café’s Thai Buffet is available until 31 August 2018. Price is RM110 nett per adult. For reservations, call Melting Pot directly at +603 2717 2233 (direct line). Any enquiries or private events, do email to fbkl@concorde.net. Sushi is practically a staple now in Malaysia. Malaysians love sushi so much, there always a sushi restaurant at many areas all over the country. It takes a lot to be a true-blue sushi chef. While there are many out there, only a small group with traditional sushi skills can earn the real title of a sushi chef! 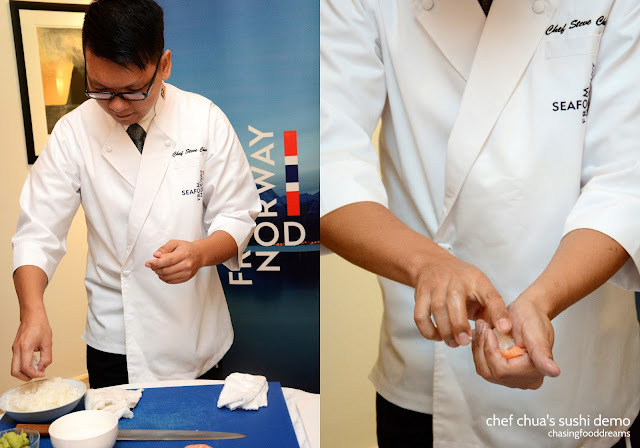 At a recent luncheon hosted by The Norwegian Seafood Council, Norwegian Ambassador to Malaysia HE Gunn Jorid Roset announced that Chef Chua Kok Hua will be representing Malaysia at this year World Sushi Cup 2018. An annual event held in Tokyo, World Sushi Cup unites 40 of the top sushi chefs from around the world, vying for the top spot in a prestigious sushi-making competition. Out of the many sushi chefs in Malaysia, Chef Chua emerged as the winner in the qualifying competition back in November 2017, to represent Malaysia in the World Sushi Cup. The qualifying competition was held in conjunction with the Global Sushi Academy training, a collaboration between Norwegian Seafood Council and World Sushi Skills Institute, the only officially recognised sushi body in Japan. Norwegian Ambassador to Malaysia HE Gunn Jorid Roset kicked start the event with her speech. This was followed by a presentation by Regional Director (Southeast Asia) of Norwegian Seafood Council Mr. Jon Erik Steenslid. He shared several videos on how seafood such as Salmon and Fjord Trout are cultivated in Norway and why it is very safe to consume seafood from Norway. Did you know that Norwegian salmon and fjord trout are the most preferred choice of fish in sushi restaurants in Malaysia? Mr. Steenslid proceeded to also debunked the rumours and bad press linking salmon to parasitic worms when in fact, the real culprit is usually the unhygienic handling of the fish. Salmon and fjord trout raised in Norway are under strict control with proper quality control that ensures all their salmon and fjord trout are safe for consumption. Proper handling of raw fish is also of paramount importance for trained sushi chefs in Japan. As most sushi chains in Malaysia uses salmon and trout from Norway, this educational programme for sushi chefs run by the Norwegian Seafood Council is timely and will help ensure food safety through hygienic handling of the fish. Positive indicators from findings of Seafood Consumer Insight showed that Norway is still the most preferred county of origin when Malaysians purchase salmon and fjord trout and the fact that Norway scored high in terms of reputation index as the country of origin for salmon and fjord trout are testaments to the rising popularity of Norwegian salmon and fjord trout. For centuries, seafood has been both a basic source of food and an important trade for Norway, hence it is without a doubt that Norwegians are well-known for their unsurpassed knowledge and experience in every aspect of handling seafood from the sea. Not only do we see that Norwegian are highly skilled, the passion to brave the harsh cold weather in the country also affirms that Norwegian truly takes pride in producing some of the best seafood in the world. Here's a video on how Norwegian Salmon is cultivated. Once you view the process, you will understand how much pride Norwegian takes on this whole process. 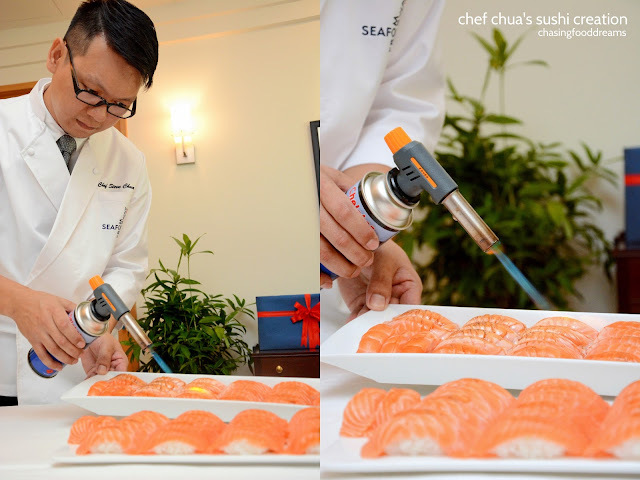 After the presentation, Chef Chua was presented with his official chef jacket as well as an exquisite sushi knife for the coming World Sushi Cup. Having to work his way up in the culinary world since he was 16, Chef Chua started his journey in Singapore in a Chinese kitchen of a five-star hotel before he switched to Japanese cuisine. It was his childhood memories that drew him to Japanese cuisine which interest in working with fish as he grew up in a fishing village. He had to adapt to a whole different culture in terms of hygiene as Japanese cuisine requires special handling of raw food for consumption. His culinary journey was no easy feat but with much discipline and perseverance, Chef Chua is now the owner of Two Chefs Lab, offering fusion Japanese cuisine and coffee culture, in Sungai Long along with a fellow chef. Chef Chua also proceeded to give a traditional Edomae sushi making demonstration. Perfectly formed salmon sushi along with his special and beautiful sushi platter was an enticing moment for everyone present that day. This was followed by a sumptuous 4-course lunch highlighting sublime Norwegian salmon from Chef Chua. We dined on Salmon Bruschetta, Salmon Belly Consommés, Salmon Sushi Fiesta and Tofu Cheese Cake. Needless to say, salmon was sublime in every bite. Prepared with minimal cooking and seasoning, the salmon tasted of oceanic freshness.